I went down to Wellington’s spectacular waterfront today to have in ice-cream. Being a diabetic, ice-creams are not recommended. However, having decided to treat myself to one (why not?) – it had to be the best on offer. If you’re going to sin, you might as well sin in style! An ice-cream from Kaffee Eis – plum to be exact. And it was worth every loving lick! To compensate, I went extended my walk. 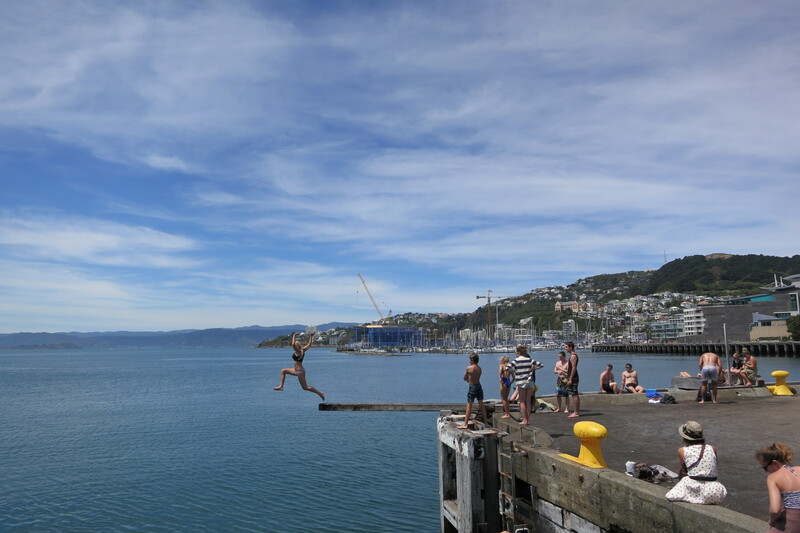 Photographed at lunchtime today – just one of the many people enjoying a brilliant summer’s day on the Wellington waterfront. This entry was posted in Diabetes, Food, Photography and tagged diabetes, Kaffee Eis, love, summer, weekly photo challenge, Wellington Harbour, Wellington waterfront on January 29, 2013 by Rossi. 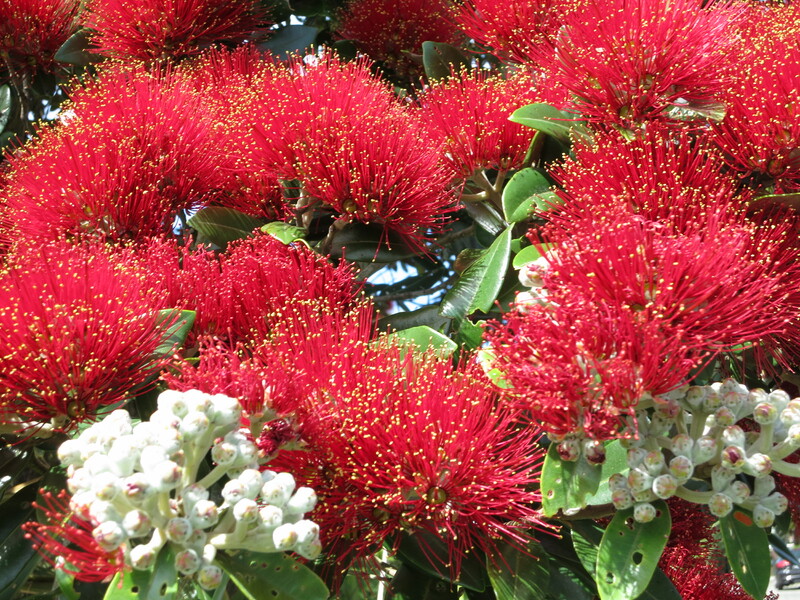 In New Zealand, the red blooms of the Pohutukawa tree herald the arrival of summer. The theory goes, that the early the flowering, the longer the summer. I took this photograph while climbing to the summit of Mount Maunganui (on the Coromandel Peninsula) early in the morning on New Year’s Day. I was not alone; many other walkers and runners started the year with the same good intention. I loved our few days spent in Mount Maunganui. Great beaches, great surf, great food -surrounded by beauty. Hidden by the tree on the right hand corner of this image is Tauranga. 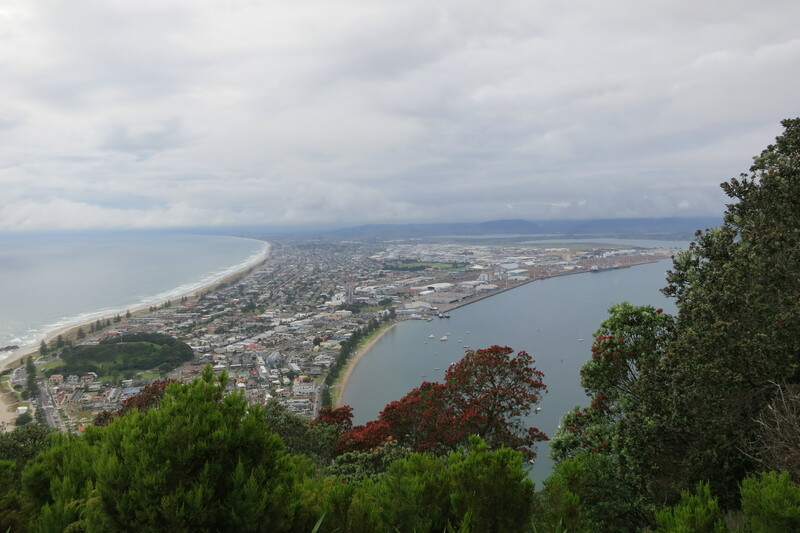 Mount Maunganui Beach is to the extreme left, with Pilot Beach (lined by Norfolk Pines) is centre. This entry was posted in Photography, Travel, Uncategorized and tagged Mount Maunganui, native, New Zealand, Pilot Beach, pohutukawa, summer, Tauranga, weekly photo challenge #beyond on January 23, 2013 by Rossi. In this topic, I feel spoiled for choice, so I may just have to post a daily photograph. This photograph was taken on Matarangi Beach, which is on the Coromandel Peninsula – North Island, New Zealand. I was blown away by the beauty. Early morning walks were my favourite times of day – a time to absorb the air, the sounds and the silence. 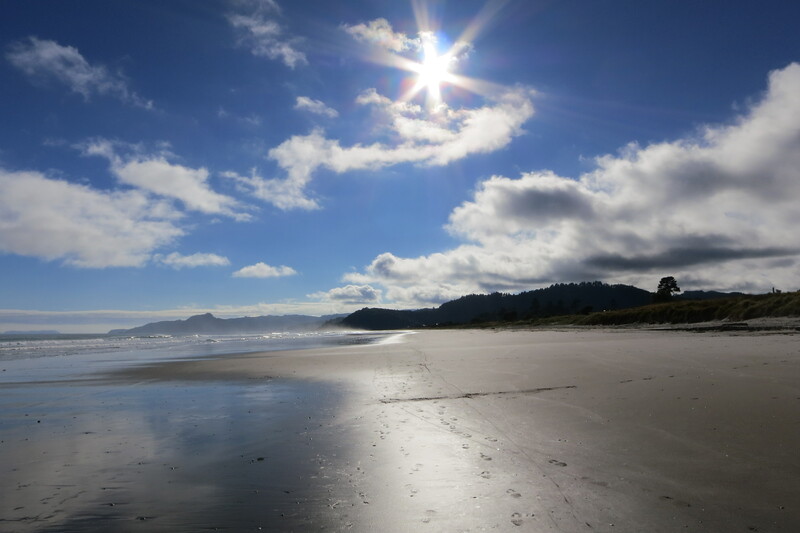 This entry was posted in Photography, Travel and tagged Coromandel Peninsula, Matarangi Beach, New Zealand, North Island on January 21, 2013 by Rossi. It had been a miserable day, with unrelenting rain, so last night we went to Wellington’s Embassy Theatre to see Peter Jackson’s The Hobbit. The Embassy is a theatre, which was opened in 1924 and was refurbished in 2001, in time for the world premiere of the first of Peter Jackson’s Lord of the Rings trilogy. The theatre is gorgeous – an very stately old dame. As you enter her wide doors on Cambridge Terrace, you ascend to the first floor via elegant curved stairways with beautiful art deco tiles in deep blues and greens lining the walls. She always takes my breath away. Last night I searched for the tile I’d heard about at a recent funeral. One of Wellington’s beloved, an extremely kind and generous philanthropist, funded the tiling of the walls. All he asked for in recognition of his generosity was for one tile to be placed honouring of his parents. I found it exactly where I thought it would be, very simple and discrete – with only a christian name for each of them and the initials of their surname – perfect. I felt so moved by this one simple gesture that I wanted to hold my fingers to my lips then press them gently against the tile. Choc-dipped ice cream in hand, I settled into my sumptuous leather seat, sponsored by another well-known Wellington identity. The lights went down plunging the auditorium into near darkness but for the latticed domes on either side of the screen. After a one-handed scrambling at the bottom of my handbag for my camera clutching my ice-cream cone in the other, I managed to take just one photo. 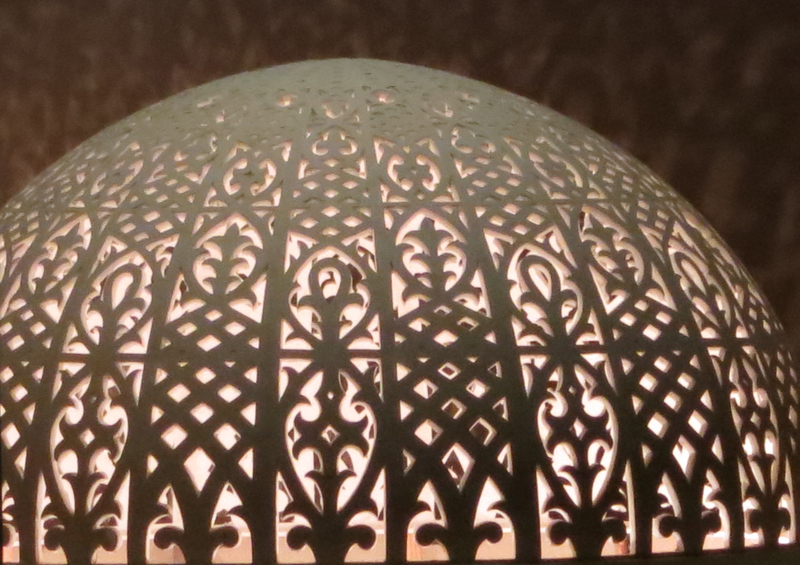 If I’d had more time, and two hands, I would have tried to show the magical lattice effects on the surrounding walls and ceiling. This entry was posted in Design, Memories, Photography, Uncategorized and tagged Embassy Theatre, Lord of the Rings Trilogy, Peter Jackson, The Hobbit, Wellington on January 15, 2013 by Rossi. 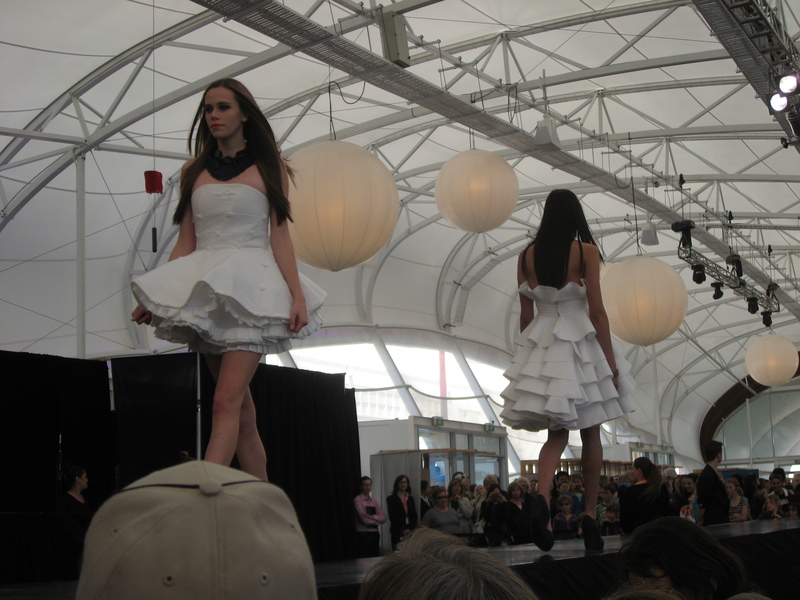 These dresses were part of the annual New Zealand Fashion Week which includes a category for young designers to design and construct a cocktail dress made only from toilet paper. The results, many taking hours and hours of painstaking work, are clever and stunning. This entry was posted in Fashion, Photography, Uncategorized and tagged design, Illumination, New Zealand Fashion Week, toilet paper, weekly photo challenge on January 12, 2013 by Rossi. I know the week this challenge was put out, is long gone. In the absence of another challenge, here is my interpretation of delicate. Diabetes be damned – there are plenty of days in the year for denial and this wasn’t one of them. I lovingly savoured every heavenly mouthful. Mills Reef Winery is situated in the little hamlet of Bethlehem in New Zealand’s Bay of Plenty – not far from Tauranga. A fabulous destination with great food. 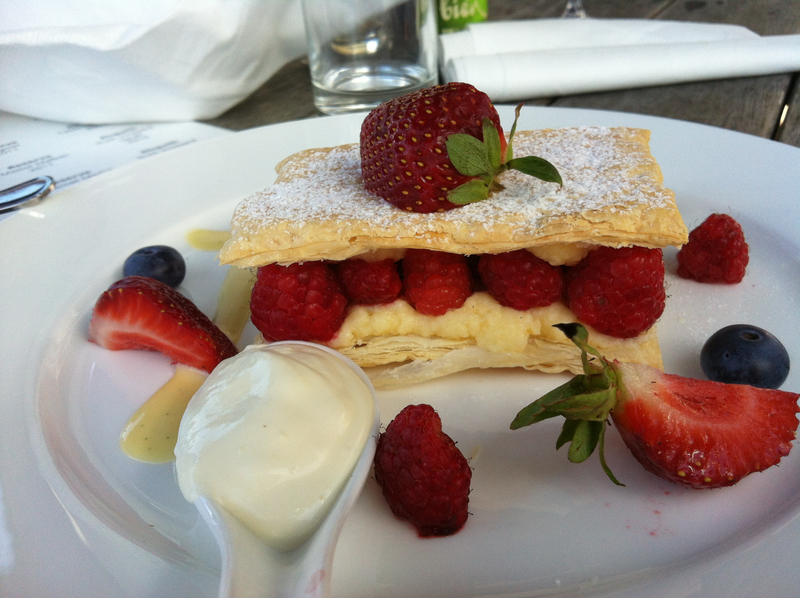 This entry was posted in Diabetes, Food, Photography, Uncategorized and tagged Bay of Plenty, Bethlehem, Mille feuille, Mills Reef Winery, Tauranga on January 6, 2013 by Rossi.